With public status updates, you can let your customers know where their feedback stands. Internal statuses let you send a separate private update to team members who are licensed UserVoice admins or Contributors. Internal teams will be happier and more engaged when they have context from the Product Team, even if you're letting them know why an idea is not a priority. 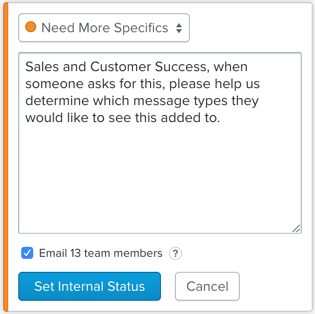 You can also use these internal updates to ask team members for specific details about an idea. *Please note: This article is about internal idea statuses which are different from public idea statuses. If you're looking for public idea statuses see this article. Why use internal statuses for ideas? Ask your customer-facing teams specific questions so they can collect more information. Inform sales and marketing when a feature is planned for launch so they can plan accordingly. Help provide context to internal teams why an idea is not a priority so they align on vision. Ask internal teams if they have any ideal beta customers so you can further test. Who can see internal statuses? Team members in UserVoice who have a Full Access admin license or Contributor license. When you post an internal status update, you have the option to send an email notification to the team members who have captured feedback for that idea or who have subscribed themselves to it. 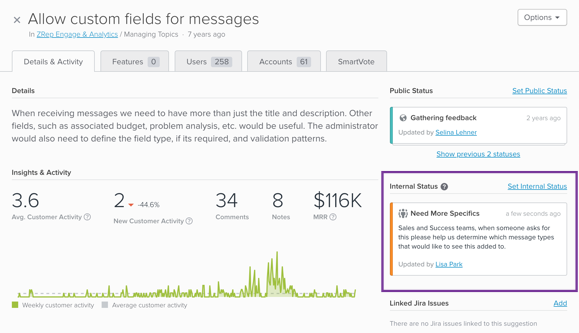 In the UserVoice admin console, internal statuses will be visible on ideas along with the public status. Internal statuses will also be visible to Contributors within the Contributor Sidebar. They'll be able to see an idea's internal status alongside the public status. 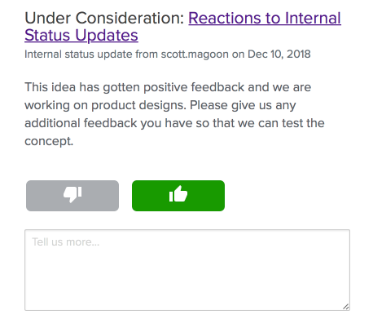 In the "Status Updates" section of the Sidebar, Contributors can review updates on all ideas ("All Updates") and updates on ideas they've captured feedback for or have subscribed to ("My Updates"). 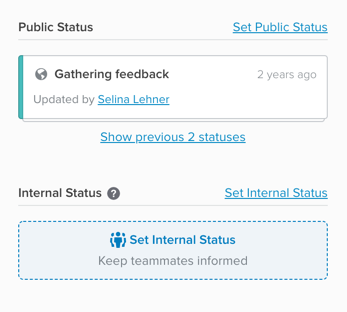 You can update an idea's internal status and public status from the admin console. From the "Suggestions" section of the admin console (lightbulb icon), click on an idea to view it. On the idea detail page, you'll see the option to post status updates and view previous updates in the top-right. Select the Status you want to use. Add a message which will be visible to internal users (Optional). Check the box below if you want to send email notifications to internal team members who have captured feedback for the idea or who have subscribed to it. Click "Set Internal Status" to finalize the update. 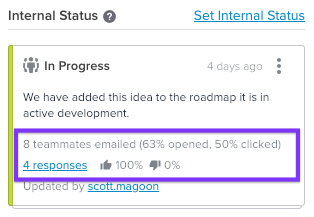 When contributors and admins receive the internal status email, they will see a thumbs up and thumbs down icon at the bottom of the email. They can click one to give their reaction, and then be taken to a web page where they can change the reaction if they choose, and give more details around their feedback. You can then see reactions to the status update when viewing an idea in the admin console. Click the responses link to view the feedback your internal team members shared. 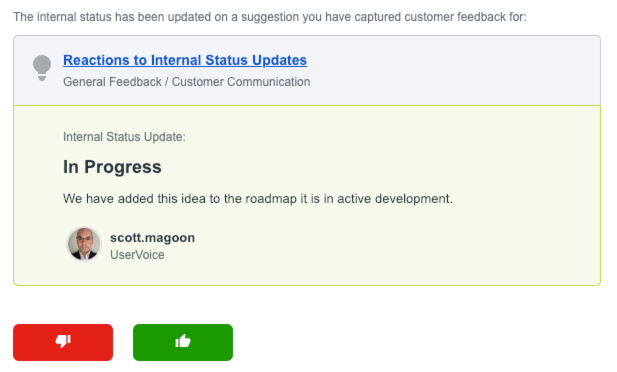 This helps you get valuable feedback as you post status updates and close the communication loop with internal teams. Can I customize the status options? Yes, you can create your own custom internal statuses. In your UserVoice admin console, go to "Settings" -> "General" -> "Suggestions" -> "Internal Statuses". Here you'll have the option to edit your Internal Statuses and add new ones. You can also choose a color to represent each status. *If you edit the name or color of an existing status, all ideas which have that status will show the new name/color. Q. Can I send internal status updates to team members who are not licensed UserVoice admins or Contributors? A. No, internal status updates can only be sent to users who have a Contributor license or a full access admin license. If you need to send status updates to other subscribers you can use public status updates. Q. Can I customize the status update email notification? A. Not at this time. If you'd like to see this added, please add your support to the idea on our forum.